Whether you've got a big road trip planned this summer or just have a fan of transportation and vehicles, this month's Supper Club apps are sure to be a hit with your family! Use apps as a catalyst for interaction, not a replacement of it. For tonight's craft, we made magnetic car tracks. Guest Post: Every Hero has a story… but why do they all seem to look the same? This summer, I have had the privilege to work with Carissa for my library school practicum at UW. Our summer reading theme this year (like many of yours I am sure!) is “Every Hero Has a Story!” capitalizing on our Marvel mad society where these days every summer there is at least 1 blockbuster where someone is wearing a cape. But unfortunately, much like the Marvel universe, we are encountering a world of books and resources where our heroes do not necessarily reflect the diversity of the community we live in. The biggest lesson I have learned watching Carissa put together our Superhero Story Time kit is how to dig and keep looking. And how when something just doesn’t exist, we need to improvise. This is definitely true in our felt board collection. Inventorying felt boards at the start of the summer made me realize we mostly see animals from woods, farms, even jungles… but not superheroes and not a very diverse cast. This was so much the case, that a few years ago, Carissa actually created her own rhyme and felt board featuring a… wait for it… GIRL super character! I was inspired. I picked up my felt and scissors and got to cutting. Meet Darius! Darius is modeled after one of my old students, and who I had in mind when creating an Enthusiastic! Energetic! But not always organized... hero. Daruis’ brown skin and dark textured hair were chosen to better reflect our children of color who are also frustratingly not featured predominately in our superhero stories. They deserve to see their super selves too! Darius is loyal! Friend to all those in need! Now if he could only remember his super suit! I hope his poem and this pattern adds to all your story time collections this summer and for years to come. What's that sound? I heard the call! For I'm the greatest superhero of them all! I'm off, I'm ready, I'm almost there! Oh wait... I'm in my underwear? Now I'm set and ready to go! And my goggles to increase visibility! Now I'm off, I'm out the door! Why do I think there's something more? Where I should be covered.... Oh no! Wiz gees! To go adventuring near and far! There's no more crime fighting left to do? 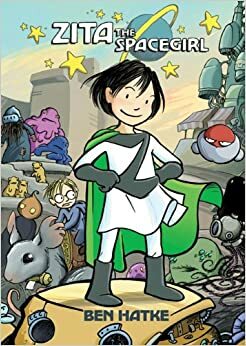 Zita the Spacegirl trilogy by Ben Hatke: these are the #1 hit with everyone. My son has read these each at least 5 or 6 times. 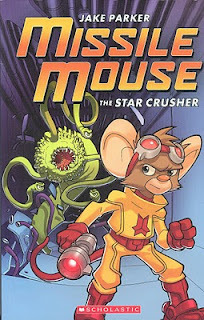 we both love the illustrations and the storyline (it does have a few dark moments and there's some magical zapping and laser action if that doesn't suit your threshold for violent action). Some of his favorite bits are the sketchbook excerpts (sort of like out-takes) at the end of each book. 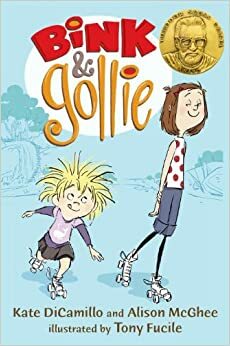 Bink & Gollie by Kate DiCamillo: not technically graphic novels, but we are huge fans and i wanted to make sure everyone had heard about this series. quirky friends with quirky adventures and lots of pancakes. 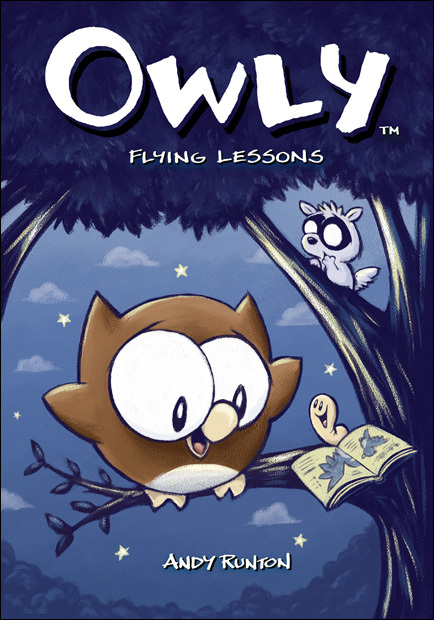 Owly (series) by Andy Runton: this gentle series is wordless, but uses pictograms (pictures in speech bubbles to represent speech) frequently. I soon discovered that if the reader isn't sure yet what all those symbols represent (like an exclamation point or a skull and crossbones or a lightbulb), then those symbols are just as mysterious as words are. It's not a bad idea to read these together at least the first time to interpret some of the images. If you like this series, you're in luck! There's a bunch of them! 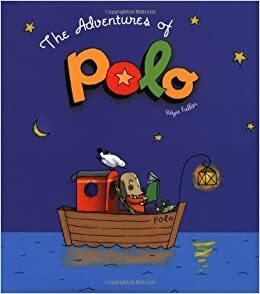 Polo (series) by Regis Faller: wordless and gentle, these are often shelved at libraries within the regular picture books, but they are stories told in series of boxed images, so I'm calling them graphic novels. They are quick reads and my son doesn't seem interested in re-reading them very much, but I adore them. 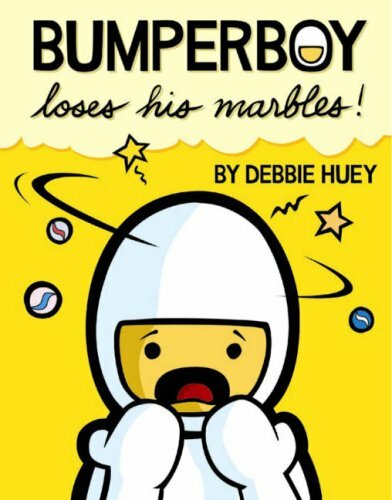 Bumperboy (series) by Debbie Huey: super cute tales of a boy who travels between worlds through "borp holes" with his dog, bumperpup. these are out of print, but you might be able to find them at your local library or at a used bookstore. also there are earlier self-published tales about bumperboy and bumperpup available on the author's website. 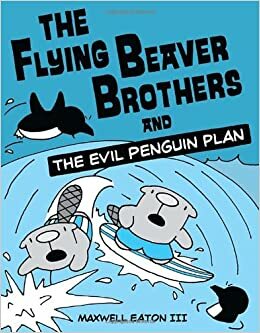 Flying Beaver Brothers (series) by Maxwell Eaton III: funny, slightly odd books about Ace and Bub, who are (you guessed it) beaver brothers who "fly" via giant sling-shots loaded with hang gliders. 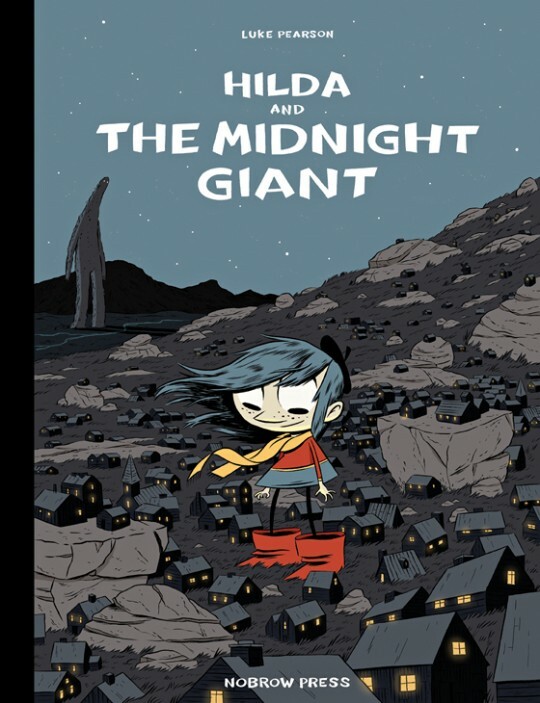 Hilda (series) by Luke Pearson: these have a magical, mystical element and occasionally hint at darker stories, but they always turn out to not actually be as scary and foreboding as originally suggested. 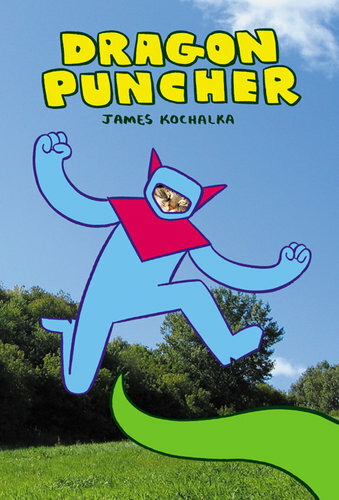 Dragon Puncher (with sequels!) by James Kochalka: this one is completely bizarre and i didn't "get it" at all until i read a review that pointed out that the author had authentically captured the type of play that really happens in backyards all the time. after reading that, this book (which my son quickly memorized) makes total sense and is really kind of brilliant. Also, fun to read dramatically. And there's a sequel and a third coming out sometime this year! 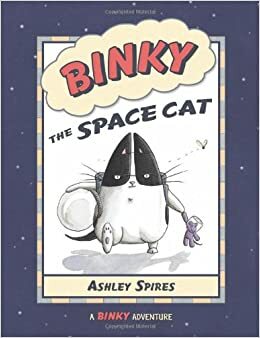 Binky the space cat (series) by Ashley Spires: hilariously silly adventures of a cat who refers to anything outside his house as "outer space" and who feels compelled to protect his humans from the aliens (bugs). 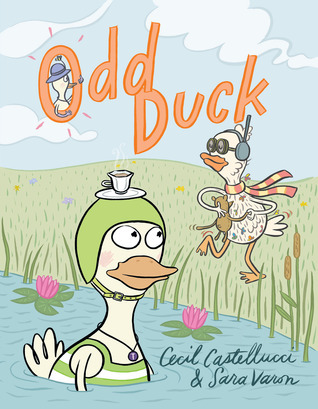 Odd Duck by Cecil Castellucci and Sara Varon: Sara Varon has written several books that are sort of borderline okay for young readers. this is probably the most okay one? Robot Dreams (wordless) and Bake Sale are also mostly okay? here's the thing--her books all feature very whimsical and friendly characters, but some of the underlying themes are really huge. Odd Duck addresses the concept of making assumptions about others and judging them and wanting to be your own person and.... all that might be somewhat lost on young readers, but they can enjoy the books anyway. Reader beware that some of her titles (Sweaterweather for instance) contain some more adult activities (like smoking) and should be previewed before sharing with children. 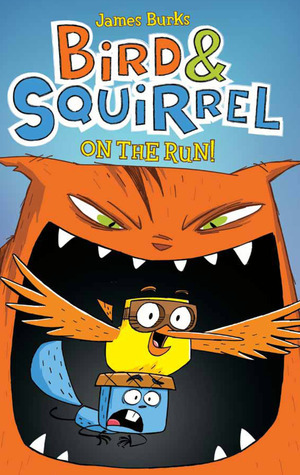 Bird & Squirrel by James Burks: wacky antics of two friends, one of whom is a worrywart and the other who's a daredevil. also has a sequel. 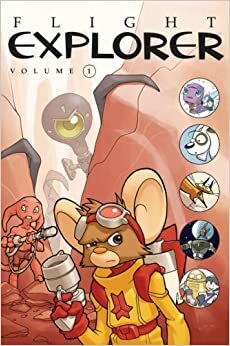 Missile Mouse by Jake Parker: these are a bit on the violent side for me, but my son loves them and i can live with them. Flight Explorer vol. 1, ed. by Kazu Kibuishi: an anthology of short story comics by some excellent artists. there are other books in the "Flight" series and the "Explorer" series but some of those are really for older readers. Flight Explorer vol. 1 is much more friendly for young pre-readers. 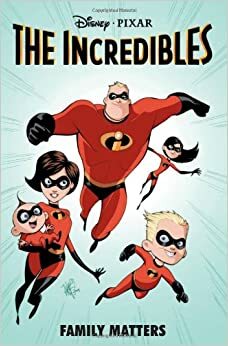 The Incredibles (graphic novel series based on the movie) by various authors: worth noting if you have a huge superhero fan in your house but you're not crazy about the classic superhero comics. My son loves these more than I do, but I wanted to include them in the list anyway. monster on the hill by rob harrell :: We read this one together and enjoyed it, though I toned down a few words (like "bloody"). it's the surprising story of a town who wishes their monster were more fierce. birdcatdog by lee nordling :: wordless book that tells the story of three animals. you can read a single animal's (visual) storyline or read all the storylines at once to see how they intersect to tell the whole story. fascinating concept! the emperor's new clothes illus. by jeffrey stewart timmins :: the classic tale, told in the classic way, but with cartoony images in tea-stained tones. nicely done and perfectly appropriate for kids. glad to see there are also two other classic fairy tales in this series. Korgi series by Christian Slade Wordless, mostly gentle and surprising. The illustrations are black and white line drawings, but never so busy as to be overwhelming. These would be fun to have your child "read" to you (i.e. tell you in their own words what's going on in the pictures of this story). Would you like to see more lists like this one as we continue to discover new graphic titles and as my son grows older? Leave me a note in the comments! 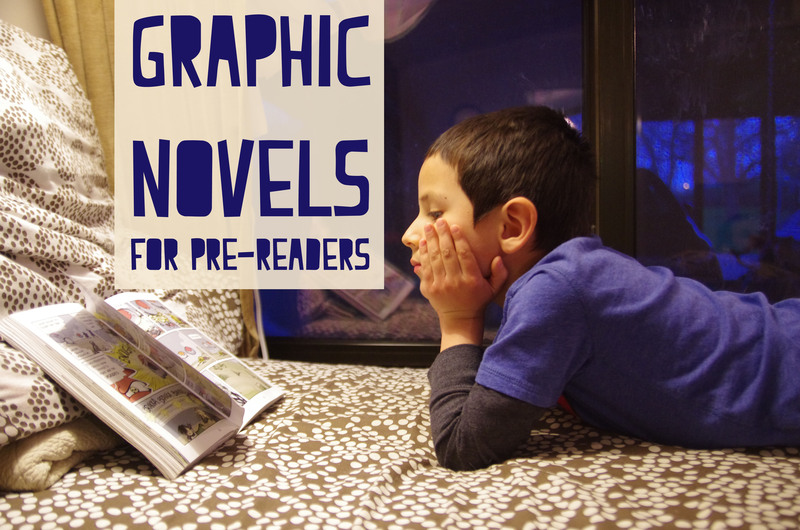 One final note, if you're still not sure whether graphic novels count as "real" reading, read this.